When it comes to our first choice for comfortable clothing, leggings are one of our favorite wardrobe essentials. We wear them for everything from working out to lounging around the house to serving up off-duty supermodel vibes with street style looks and — let’s be honest — even to the office. They also come in so many different material and style choices that we never hesitate to add a new pair to the growing collection in our dressers. Since we purchase active and loungewear so frequently, we prefer to stock up on leggings while a good sale is going on. Lucky for Us, our favorite leggings brand has so many designs available for as much as 50 percent off right now! Yes, we mean the Nordstrom house brand Zella and yes, so many great leggings choices are available at a sweet sale price! The brand has become a favorite with so many reviewers noting how flattering they are and raving about how well they hold up over time. Right now, there are so many cool sale options to choose from including high waist silhouettes, fun prints and those trendy details we adore like mesh inserts. The Zella In Dreams High Waist Leggings is our favorite from the sale section and it’s obvious why. See it: Snag the Zella In Dreams High Waist Leggings (marked down 50 percent off its original $75 price, now $37) while so many sizes are still in stock. Prefer a different style? 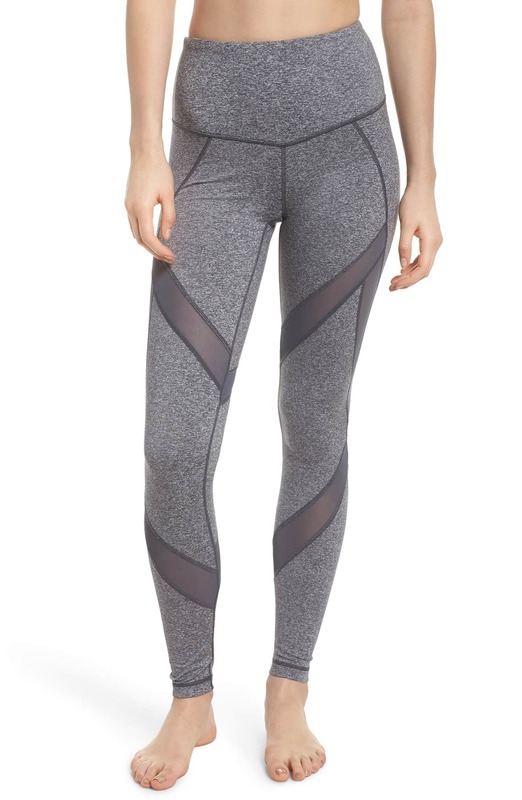 Browse the rest of the Zella leggings on sale at Nordstrom right now! The Grey Graphite Melange color is an alternative for the hoard of black leggings we already own but still a neutral. The leggings also have all the details we love in a good workout pair. They have a high waist silhouette plus a wide supportive waistband for extra support in the tummy area. The moisture-wicking fabric is meant to dry up perspiration quickly so we stay cool and comfortable even when we are working up a sweat during physical activity. Whether running along a trail in our neighborhood or enjoying an hour-long hot yoga session, these leggings are designed to save the day! Breathable mesh inserts travel up the front and back of the leggings in a stylish slanted design meant to vent excess heat and keep Us cool while we are on the move. These leggings also feature a fabric blend that includes spandex, making them stretchy and durable. The blend is designed to prevent thigh chafing, which is especially a plus. While we love our cropped leggings, these are conveniently full-length making them a practical choice for the chilly winter season. Shoppers who bought and wore the In Dreams design seemed most impressed by how well the extra waistband and stretchy fabric fits and sculpts the body. One shopper noted the leggings have the “right amount of compression.” Reviews did note that this pair is long so it is important to eye the size guide to score the best, most comfortable fit for your height and frame. Sizes range from XXS to extra large. We also appreciate how fashionable these leggings are! These are the bottoms we want to be wearing when we snap selfies at the gym. The mesh inserts serve a purpose but they also offer a sultriness to the primarily sporty look. We will be wearing these workout tights with a long sleeve T-shirt or knit top, fresh white low-top sneakers and a fun fleece or teddy bear coat for a standout athleisure look. The leggings would also look just as cool with an oversized graphic sweatshirt and our favorite pair of boots. Of course, we will not be letting a Zella leggings sale pass Us by with only one pair in our carts. Even more of our favorites are marked down in the lineup, including the Victory High Waist Seamless Crop Leggings with a seamless design that is perfect for layering underneath sweatpants or skinny jeans when the weather gets really cool. The sale also includes several leggings made from recycled fabric so we get to have our activewear fix while also choosing clothes that are environmentally friendly.